The 2019 “Night at the Movies” concert will transport audiences into “The Wonderful World of Walt” — Walt Disney, that is. This year, the University of Lynchburg’s wind symphony, orchestra, and choral groups, will perform music from Disney favorites The Lion King, Beauty and the Beast, Mary Poppins, The Hunchback of Notre Dame, Miracle, and other films. 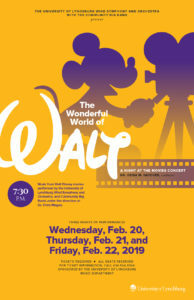 “The Wonderful World of Walt” will begin at 7:30 p.m. Wednesday through Friday, February 20 to 22. Tickets are free, but required for admission. For tickets, call 434.544.8344. Most pieces in the concert were arranged by Dr. Chris Sharp, assistant professor of music at Lynchburg. Dr. Sharp was uniquely prepared for this task, having worked for The Walt Disney Company for more than a decade. “Prior to my college-teaching years, I was a musician and music arranger/orchestrator for Walt Disney World,” Dr. Sharp said. “I worked there for over a 13-year period and still have professional connections with the Orlando music community. Dr. Sharp also was a bandleader and trombonist at the Magic Kingdom, EPCOT Center, and Disney/Hollywood Studios. By “Miracle,” Dr. Hatcher is referring to “Suite from Miracle,” from the 2004 Disney film that tells the story of the “miracle on ice” — when the 1980 U.S. Olympic men’s hockey team defeated powerhouse Russia in the medal round. Dr. Sharp is excited for opening night as well. “Oeida goes way out of her way to produce these musical extravaganzas she has come to be known for,” he said. “I know of no other school who routinely puts together such elaborate, multimedia presentations, and this is my fourth college job. By all rights, we should be charging top dollar for these shows.